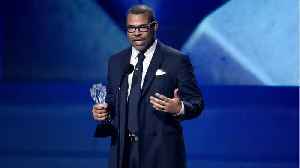 While I mentioned the two categories "Get Out" won in 'The Shape of Water' leads speculative fiction winners at the Critics' Choice Movie Awards, I did not embed video of Jordan Peele accepting either award he won, as I did for the television winners yesterday. I have two, beginning with Get Out Wins Best Sci-Fi Critics Choice Awards 2018. I had a feeling Peele was a nice guy (Keegan-Michael Key always played the more disagreeable character), but it's good to hear it confirmed. Now, Jordan Peele Wins Critics Choice Awards 2018, which includes both the Adapted and Original Screenplay nominees. I'm glad I included this clip, because Peele most directly addresses the issues relevant to today's observance. One of the movies Peele beat with his "Get Out" script was "The Big Sick," written by Emily V. Gordon & Kumail Nanjiani. It won Best Comedy Movie. I'm including it here because I did not mention it at all in prior posts on the Critics' Choice Awards, as there were no speculative fiction films nominated in comedy (although "Downsizing" might have fit), and because it is also about dealing with diversity and adversity. I'm a bigger fan of Nanjiani than I was before I watched that clip. He also does a good job of summing up diversity and representation issues while still being funny. I would be remiss if I didn't mention either "The Shape of Water" or "Coco" in a celebration of diversity, so here's Guillermo Del Toro Wins Best Director at Critics Choice Awards 2018. And here's COCO Wins Best Animated Film Critics Choice Awards 2018. Molina's speech worked well as a statement about the value of diversity and inclusion. I made a promise yesterday. Best Actor in a Drama Series: "Sterling K. Brown was the only actor in a drama series nominated at this year's Television Critics Association Awards and he won Outstanding Actor in a Drama Series at the Emmy Awards, so he is the favorite." Brown won. I'll have more to say about his victory tomorrow. To fulfill that promise, here is Sterling K. Brown Wins Best Actor in a Drama Series Critics Choice Awards 2018. I have one more winner to recognize, RuPaul, who won Best Reality Show Host for "RuPaul's Drag Race," a title also earned at the Emmy Awards. Unfortunately, I found no video of RuPaul winning. Darn. If I had, I'd have posted it. Instead, my readers and I have to be satisfied with a photo of him looking fabulous with his award. With that, congratulations to all the winners! That's enough fantasy. I'll return to reality tomorrow with some real-life DOOM.